Mix together cheeses and jalapeno until somewhat smooth (about 40 times around the bowl). Add meat and mix well. 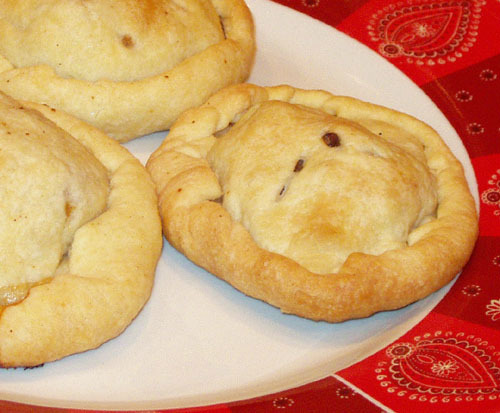 If using the empanada dough or pastry dough, separate out into 8 equal parts. Roll nearly flat. 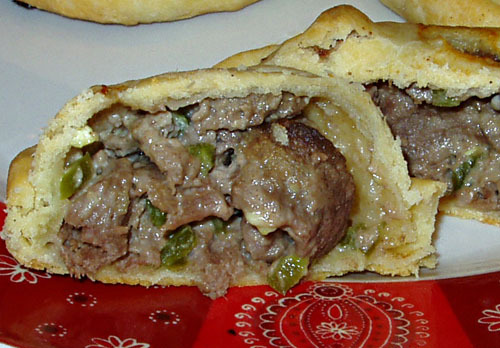 Place a heaping tablespoon of meat mixture into the center. Fold over and press close. Bake on 425 for 25-30 minutes or until golden brown. As I was rolling out the dough, I was thinking, “man, this would be a lot faster if I’d just used bread and made sandwiches in my sandwich maker”. Oh well, next time. Inside the cheeseteak sandwich... not-so-minced jalapenos! Mix salt into flour in a large bowl. Using a pastry blender (or the absolutely impossible double-butter-knife chopstick method), cut butter and shortening into flour until mix is crumbly with pea sized lumps or smaller. Slowly add one tablespoon of water, mix. Repeat this until dough forms a ball. You should definitely use your hands to press the dough together after the 4th tablespoon of water. Maybe it was the Peter Seller’s clip, maybe it was how easy the pita bread was, or maybe it’s just because I want a brownie recipe for when that pouch of yummy mix is not on sale… Whatever the case may be, I’ve lately been inspired by Michele at Veggie Num Nums to bake a lot of things. In a small microwave safe bowl, melt butter and chocolate chips. Stir every 20 seconds. I baked for 14 minutes, rotated, then baked for another 14 minutes. Today, I am using 1/2 tsp of instant coffee from a packet of Starbucks Decaf Italian Roast VIA. Cream together cream cheese and 1/2 cup butter. Add flour to make a dough. 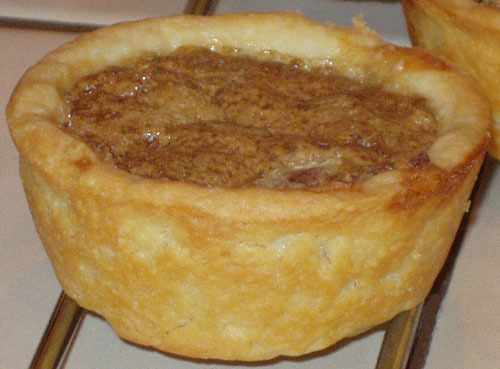 Press pastry into the bottoms and sides of a tassie pan (24 tassie size) or muffin tin (8-12 muffin size). Mix together remaining ingredients. Spoon 1 tsp to 1 Tbsp of filling into each tart for tassie pan or 2-3 Tbsp of filling into each muffin cup. 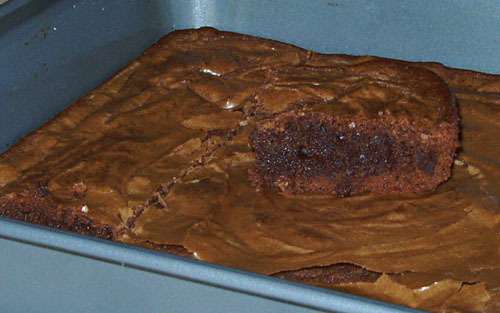 Bake 20-35 minutes. Long range, I know; but what you’re looking for is for the pastry to turn golden and/or the filling to puff up. Tassie pans are typically 20-25 minutes. Muffin pans are 30-35 minutes. You definitely want to watch after you round the mark to make sure the golden doesn’t turn brown (it happens fast, apparently!). 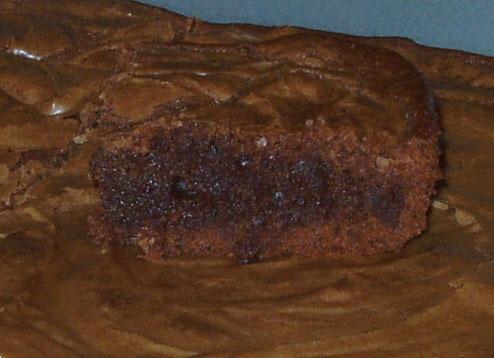 * Use these items to make your own dough, or use store bought pastry shells, or use your favorite pie crust/pastry dough. 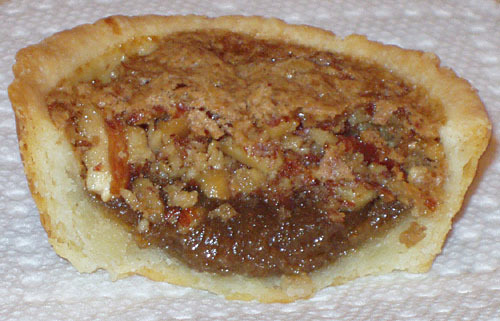 Canadian butter tarts are made like American pecan pies. You want for your gelatinous filling to settle at the bottom and for any nuts or filling to “float” to the top and create a crisp top. 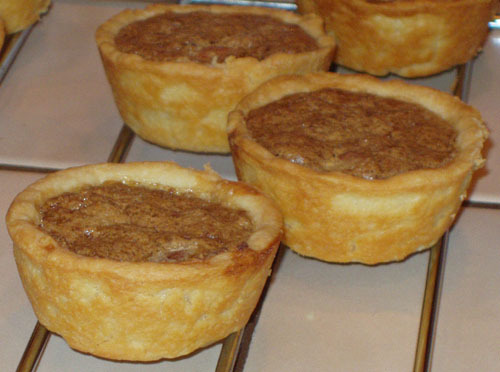 I used my muffin tin, and I got 10 butter tarts. They were perfectly done at 25 minutes on 350. A toothpick came out clean. It’s embarrassing how quickly these were devoured, so I’m just not going to tell you how many are left.